Its the beginning. At least it doesn't look too bad. 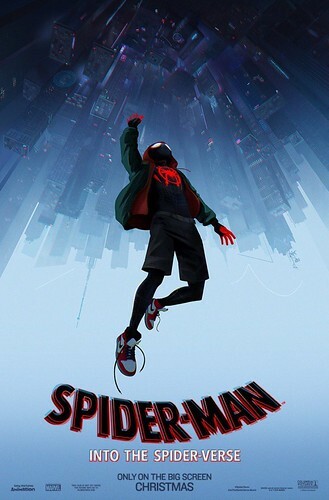 Too bad we can get a real spiderman movie, we keep getting spiderboy movies. Looked very meh to me. Can't stand the 3D teaser, but the concept seems okay. Also, how are we supposed to feel about blatant abuse of police power to influence demonstrations of affection from a child? That's half joke, half serious. I kind of like the art but I kept feeling like I was watching a 3D movie with my glasses off, it was really distracting. That, and I'm not really into the alternate universe thing. Back when Marvel started The Ultimates it had a whole bunch of potential. Miles is a cool character but I'm worried I'd just be waiting for scenes with Spidey in it. Regardless, I'll probably watch it. I think this movie looks absolutely astonishing. It’s the kind of thing that I can’t believe is getting made let alone being released in a theatre. This is pure comic book. The marvel films were close. They were as close as I thought we would ever get. But this is pure comic book. If this works out for Sony maybe WB will consider bringing some of it's better Comic Book movies to the silver screen. The Killing Joke and some of the other DC Comic Movies would be at least as compelling as this show. The Killing Joke animated movie pretty much killed any interest in seeing a killing joke movie in any shape, for me, it’s just not adaptable. Brian Bollands art is perfect. I would like to see A Serious House On Serious Earth, though. Have it be a straight up Halloween horror movie. I dunno...Spider-Man's history is steeped in him being one of the younger superheroes. The first three years of the book featured him as a high school student and after that, he was in college...which really isn't much different, at the end of the day. He may have been a college kid, but he was still a kid. Since so much of the MCU is based (in part) on the Ultimate line, having a 15-year-old Spider-Man makes sense; Ultimate Parker was in high school for the entire run. We've got an adult Parker in this one, though. I think it looks pretty damn good. "You have money, right? I'm not very liquid right now." Nailed it. This looks like it'll be a really fun movie and I like the fact that they're taking steps to separate it from the MCU and establish it as its own thing. I dunno...Spider-Man's history is steeped in him being one of the younger superheroes. With a brand as old as Spider-Man (50+ years), there's bound to be lots of different opinions. I started reading Spider-Man in the late 80s/early 90s, right after Peter got married to Mary Jane, so that had a huge effect on how I saw the character. I always considered the main (616?) universe canon, so other books - like "Ultimate Spider-Man" - were just interesting experiments to me. My Peter was a married adult and - at some point - expecting father in his mid to late 20s, with all the social responsibilities you'd expect. It wasn't until that idiotic (again, subjective) "One More Day" story line that they made him younger in the main book. But even then, he eventually ended up owning his own enterprise (so he definitely wasn't a reckless teenager anymore). That looks really cool except the voice actor for Miles is a lisping retard.